Good performances by Ferrell and Wallace and fantastic cinematography make Everything Must Go an enjoyable watch. 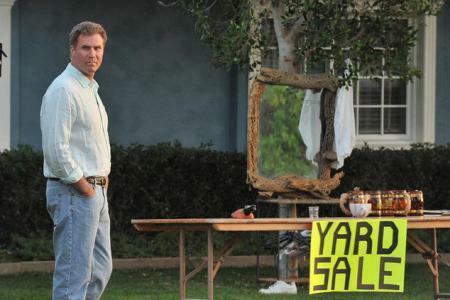 Will Ferrell puts the funny on the shelf and gets all dramatic in the low budget Everything Must Go. The former scotch loving anchorman shows the dark side of alcoholism as he loses what’s important and decides to sell the rest. Nick Halsey (Will Ferrell) is a middle aged salesman whose glory days as a salesman are behind him, but still manages to be above average at what he does. He’s let go after 16 years after one sales trip bender too many. His reward is not a car or even a gold watch. No, it’s an engraved pocket knife on a key ring. Unfortunately, Halsey decides to test out the retirement gift by slashing the tires of his boss and the knife gets stuck there. After making a hasty escape, he loads up on Pabst Blue Ribbon and heads home to find himself locked out of his home and all of his worldly possessions on the front lawn by his wife. So whats a guy to do that’s been fired by his spouse and his employer? Sit on the lawn and drink…and drink. Pabst Blue Ribbon (or PBR) is not only a blatant product placement, but a willing co-star as he downs them one after another in his recliner. His relationship with PBR is slightly threatened when his company car is repossessed. Apparently, the whole tire puncturing incident didn’t go over well with the higher ups. Although his lovely, pregnant neighbor Samantha (Rebecca Hall) tries to lend a helping hand to the neighborhood lawn dweller, other neighbors are not so tolerant. After an ultimatum by his cop/AA sponsor buddy Frank (Michael Pena), Nick decides that everything must go. Reluctant at first, he recruits Kenny, a pudgy black teen (Christopher Jordan Wallace) with a desire to play baseball. Nick and Kenny start off as quite the odd couple, but both help each other out more than they could imagine. Ferrell wisely dips his toe in the dramatic waters in just the right vehicle in Everything Must Go. He manages to show that he does have some dramatic range, albeit mainly seen in his facial expressions and comedic restraint. Nevertheless, it’s a good effort. Eliciting sympathy from a crowd that’s used to him playing George Bush or a signing, dancing, scotch-loving newsman among other comedic roles is no small task. Fellow SNL alum Jim Carrey has been at it for over a decade and he’s still a work in progress. Although not awkward playing the alcoholic Halsey who is easily his own worst enemy, Ferrell seems more at ease as the surrogate guardian to Kenny in the only relationship that evolves during the course of the film. From directing Dell Computer commercials to directing an A-list comedic actor in a drama seems like a big leap, but Dan Rush shows he had the moxie and the restraint to pull it off. Shot in Arizona, the contrast of the brightly sun lit street and the decomposing state of Halsey as a neighborhood watches keeps eyes glued to the screen despite some of the film’s shortcomings. The most glaring one being a scene with Laura Dern that has its heart in the right place, but is aesthetically out of place. Rush uses the items on the lawn not as props, but as keys to unlocking Halsey’s backstory. From a signed autograph baseball and home movies of his alcoholic DJ dad to the yearbook that leads him to Dern and clues to a lost past. One of the failings of small movies is its ending and unfortunately, this continues the tradition. I won’t spoil it for you, but it will be seen as underwhelming to many. Nevertheless, Everything Must Go is a movie just good enough to see about a man who realizes that sometimes to make the first step forward, you have to lighten the load.